Days surely fly! It feels it’s only yesterday when I thought I should start a marathon and here we are into the 10th edition. As you might know, we had a break in between, and we have a strong group of bloggers wanting to run this every month. I am very thankful to have them support every edition of Blogging Marathon. As with every edition, the themes are carefully thought through to make it interesting and exciting. For the first week, I am doing Preps and Preserves. I was finally able to include this theme and wanting to do it, and also hoped others will take it. Looks like I am the only one to do it and I hope I do justice to the theme. I will be sharing some of the preps I follow in my cooking. It could be something that’s everyday affair in most kitchens but I hope it will be a good tutorial for novice cooks. Prepping vegetable has always been something that fell on me from a very long time. I have always been an assistant for Amma and used to prep all the vegetables for her. So much so that I learnt how and what vegetable should be cut in which fashion much before I actually got into cooking. I think it’s very important to learn this before one actually does the final cooking part. I know I received lot of feedback on my post about cutting and using Onions in different ways. I would love to hear your method of prepping if you follow a different method. 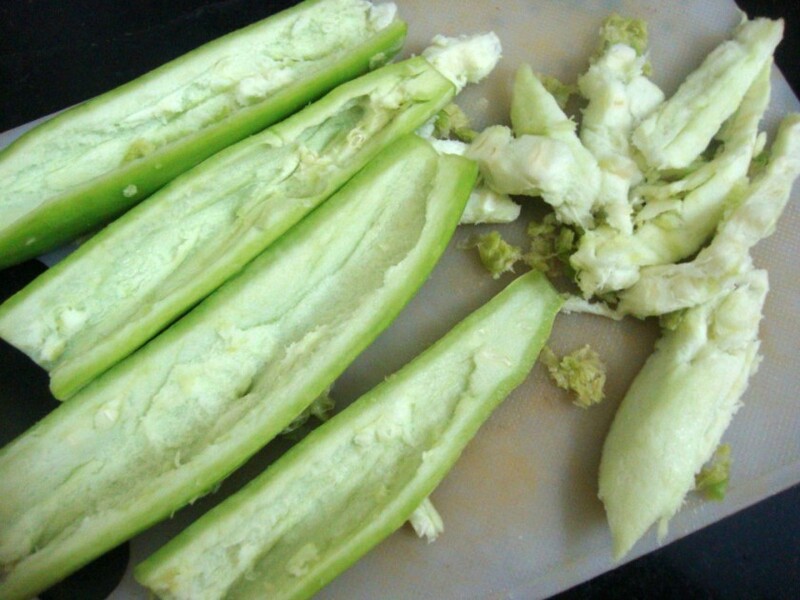 First in the series is about cleaning Snake gourd. 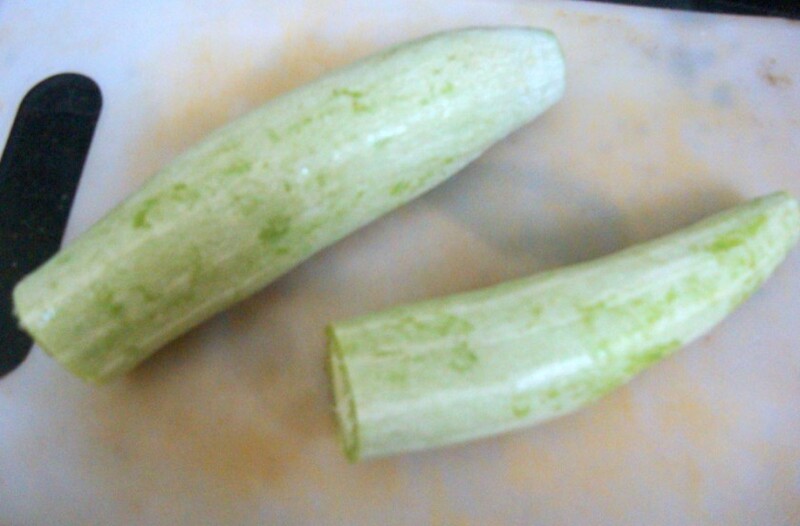 These snake gourds are the smaller variety that are available. Trim the ends and wash well. Cut in middle into equal parts. 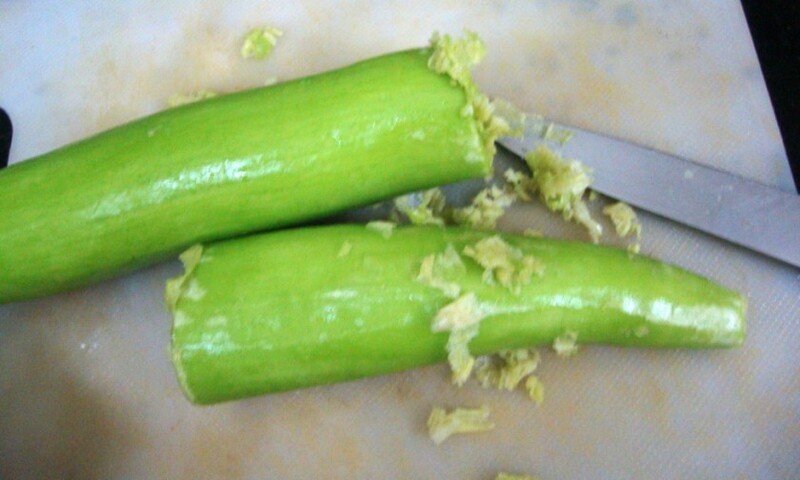 Using a sharp knife, scrap on the top from top to bottom holding the snake gourd in your left hand. This way would be prefect way. Continue with the other pieces also. Once done, holding the snake gourd straight slit in middle. 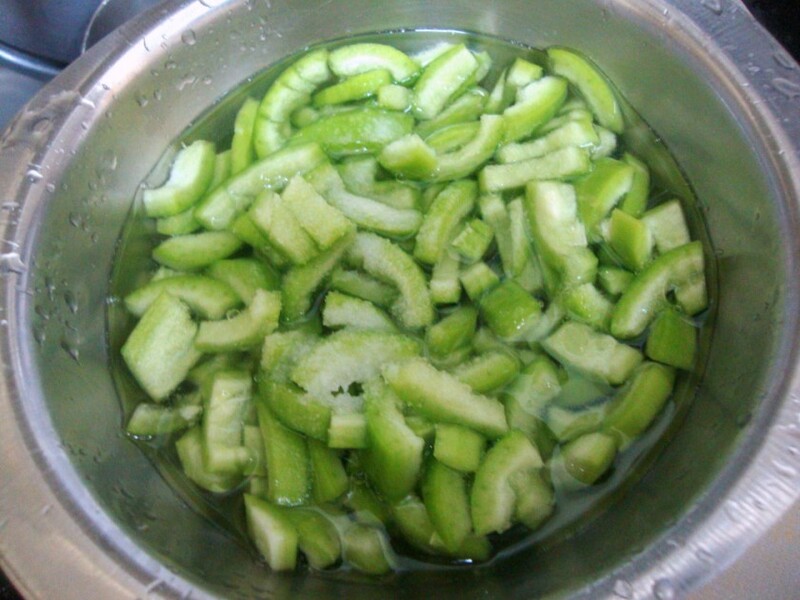 If the vegetable is not tender, the inside part will not be edible. Using a spoon, scoop the white soft part out. Once done with all the pieces, wash well. Depending on what you are going to make, chop them accordingly. If I make a Kootu, I chop them into small pieces. 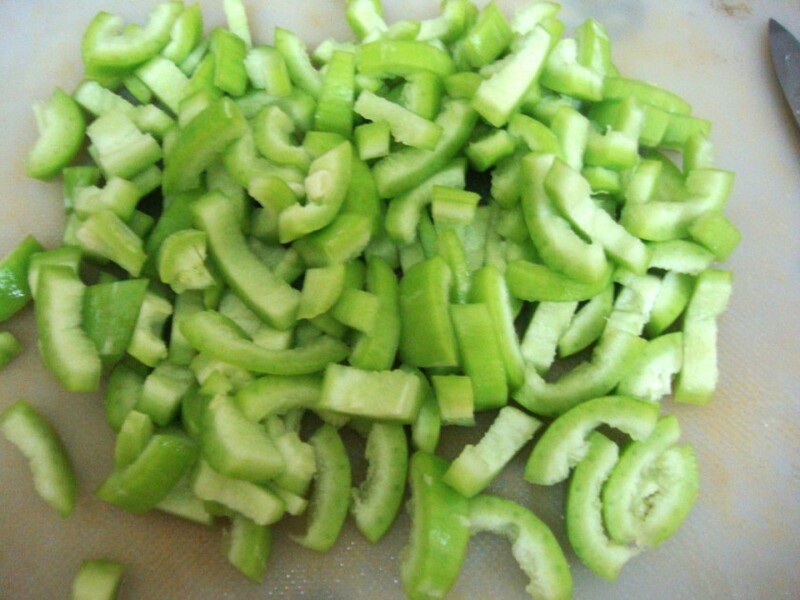 For stir fries, chop them into 3″ pieces as above. Once chopped, take them in a bowl, add salt and soak them for 10 mins. Before using the vegetable squeeze out the salted water and use the vegetable. Soaking in salted water removes the itchiness that might happen when consumed otherwise. I made Seru paruppu Pudalankai poriyal with the above. Do share your method if you happen to prep this differently. 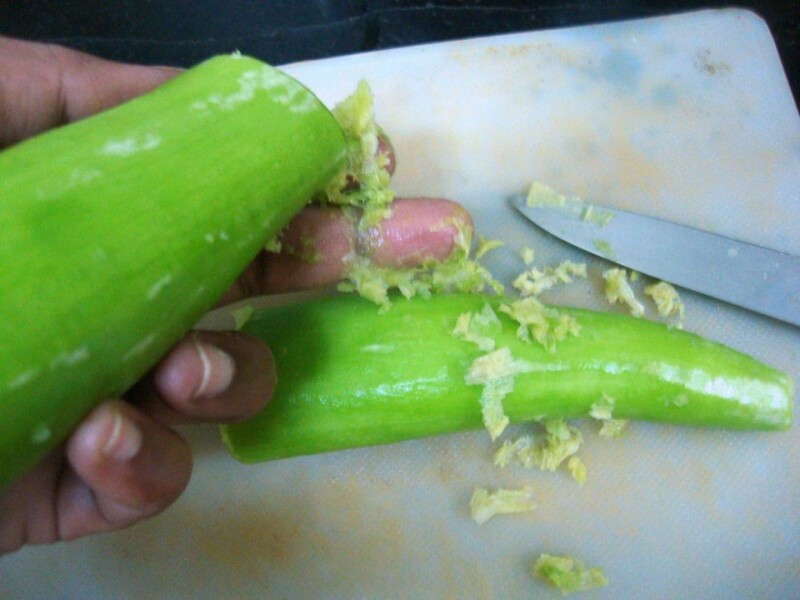 I too don't scrape the gourd,just wash it well with a scrubber and use it…. I never had to clean a snake gourd since I buy the frozen kind. Oddly chopped frozen is much cheaper than fresh ones in my neck of woods. But now I know how to clean it if I ever buy a fresh one. Very useful post. Nice post Srivalli, I am sure this is a great guide for beginners. I remember the first few days in the kitchen, I was holding some vegetables and didn't know how to progress from there about cleaning and preparing them. Nice step by step post indeed. 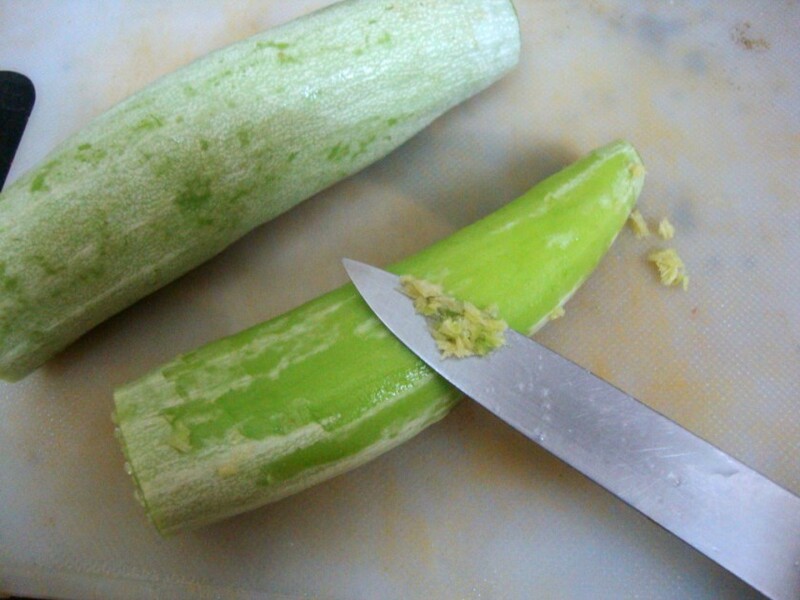 I sometimes use a fine peeler to scrape the skin. We too don't scrape the gourd and don't ever remember my mother soaking it in the salt water either. Very useful post valli!! I dont use spoon to scoop-out the inner part, i try to remove it with my hands. 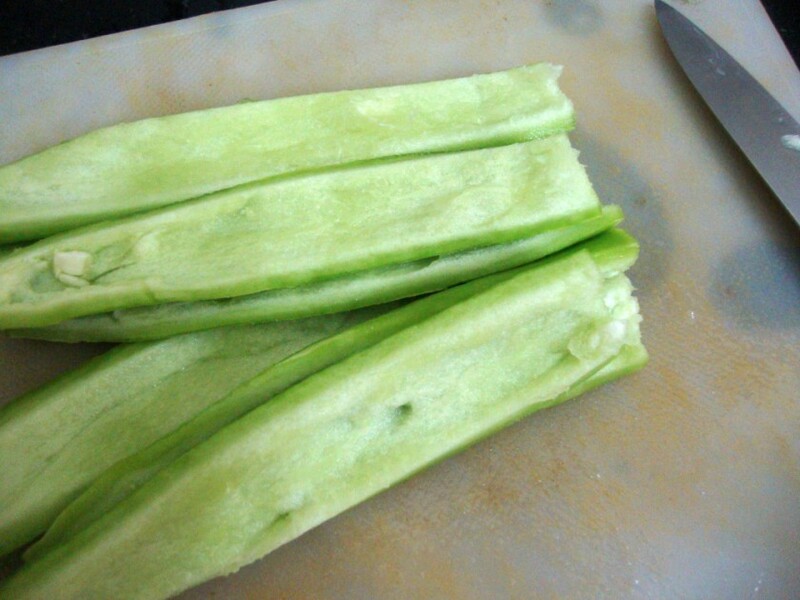 Heard that inner part is more fibrous, if u tend to use force to remove it, u remove the fibre content too!!! I do the same way too..useful post for many.. I only wash it well with water. Never have scrapped the outer part or even soaked in salt water. The water from the snakegourd is supposed to be good for health so never have squeezed the water either. 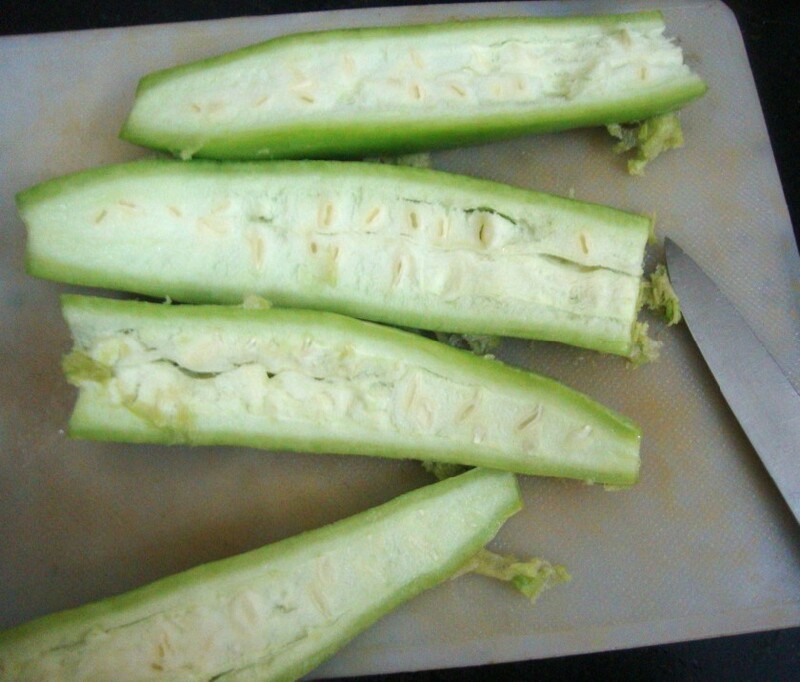 Also if the snakegourd is not tender, I remove the seeds alone.I don't scoop out the inner part. just wanted to thank you for this post! 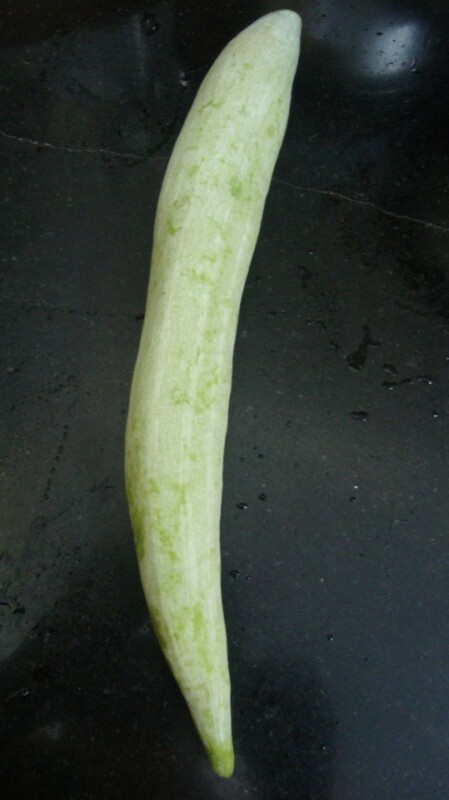 My husband got snake gourd mistaking it for ridged gourd and I had no idea how this was prepared! Your post helped a lot! why we scrape the outside, scoop out inside and remove liquid from it? can you just peel it with a potato peeler? or would i be losing some other skin part? Anon I am told that this vegetable has a tendency to give itchiness sometimes, so we peel, soak in salt and squeeze it out. the inner part if the vegetable is tender can be used, else it will be rubbery. As you said if you use potato peeler, you will be taking out the flesh also.